The Company's founder William Edward Ingram (Bill as he was always known) in the 1950’s would combine using his van for his part time business as a carton merchant with carrying out local moves and deliveries for friends and neighbours. All this was in addition to his main job which was working for The Alligator Leather Factory in St Helen Auckland on the outskirts of Bishop Auckland. Bill would work 7 days a week, he was never happier than when he was working. Bill was proud to be the first owner in Bishop Auckland of a Ford Transit van in 1966, the first year of their production. By 1968 Bill’s eldest son Ian was running his own waste paper recycling company as well as assisting his father in his carton business. Unfortunately the recycling business was in its infancy in the 60's and was not the multi million pound industry it is today; however the carton business was steadily growing with Bill making more and more sale contacts with local textile and plastic companies in County Durham and Teesside. 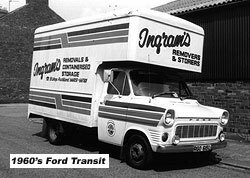 Fast forward 40 years in which time Ingram's Removers and Storers had expanded into postal and express delivery services, retail funriture delivery, domestic removals and haulage. Through the 70s and 80s there were further developments with opening warehouses, joining the BAR and serving contracts for the British Army which meant there was further requirements of containerised storage and warehouse operations. COmercial movnig services were growing. The significant shift from Domestic removal work to commercial moving was particularly welcome due to the housing recession which reached a peak in 1992. During this time Ingram's won contracts to provide document storage services for companies including the NHS, a local Accounting group and a pigeon racing club (talk about diverse!) Due to Ingram's containerised storage system this proved no problem and this area of the business continued to expand slowly. Still retaining a high profile in the North East and beyond with their domestic removals, container storage and commercial moving division, the year 2000 saw Ingram's venture into Document Storage and Archive Services; this business has steadily grown over several years with both the public sector and private sector storing their document archives with Ingram’s. In 2005 Ingram's expanded dramatically with the contract for the NHS-Primary Care Trust which was expanding. This meant the development of more advanced facilities and services for their clients; which has expanded so much in the intervening years that it was necessary in to open a purpose built warehouse purely to store clients documents. 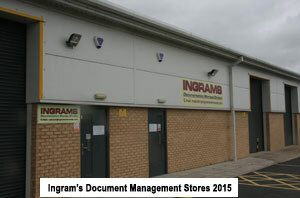 In July 2010 Ingram's open new depot for documentation record management - Century Court, Henson Close, South Church Enterprise Park, Bishop Auckland, DL14 6WA. 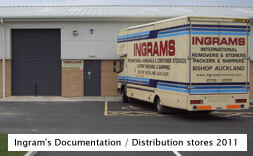 Due to the success of Ingram's documentation storage, archive and record management services it was necessary in the summer of 2010 to open a second documentation storage depot to cater for the growing demand for commercial documentation storage. The premises were specifically designed internally to maximise space and vehicle manoeuvrability. Site Security System fitted and Managed by Barrier Surveillance. Archive storage containers built & manufactured by Simpson Packaging. Opened in the spring of 2015. In addition to their head office and depository in Bishop Auckland this is the second unit the company have opened on South Church Enterprise Park on the outskirts of Bishop Auckland and is conveniently situated next door to their existing unit. The new unit will mainly be used to accommodate the demand for Ingram’s expanding domestic and documentation storage businesses. Continuous developments are being made to the facilities and equipment to cope with the varying demands of clients and new legislation. See the latest highlights that outline the top 5 reasons why Ingram's should be your first choice for Document Management and Archive Storage in the region. Ingram's in Chelsea relocating the entire back catalogue archive of the late archaeologist Beatrice de Cardi OBE, FSA, FBA. At the end of her career, she was the world's oldest practising archaeologist. A remarkable lady who passed away in July 2016 at the age of 102. See Wikipedia for Beatrice's full biography. Trading standards professionals from Which? have been assessing Ingram's and following a successful visit have given their endorsement as a Trusted Trader - a sign of reputation and trust. 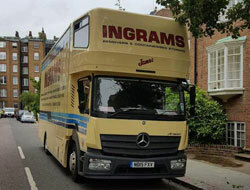 Just another way that Ingram's shows its clients that they are one of the best document storage and removals companies in the area. 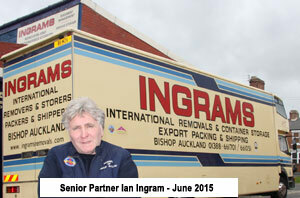 See Ingram's Trusted Trader profile for more information. Ingram's have put the final touches to our GDPR procedures and operations. We are proud to say that having reviewed all of our business processes and operations, the GDPR reviews have provided an extension of our already stringent procedures for handling people's personal and sensitive data. Full details of our policies and procedures can be obtained from our office - use our contact details to obtain further details. 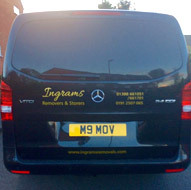 Ingram's have also recently took delivery of a new Mercedes Vito van, which will be used in two divisions of the company. i.e. Advanced packaging deliveries for document storage clients, home survey assessments and archive management collections / deliveries. In addition the vehicle is fitted with 5 passenger seats, therefore it can also be used to transport operational staff between jobs.